I guess I never thought I’d talk about fanny packs on my blog, but here goes. This is either a new high or low depending on your perspective, but I want to share an important concept to consider – especially during a slower market. 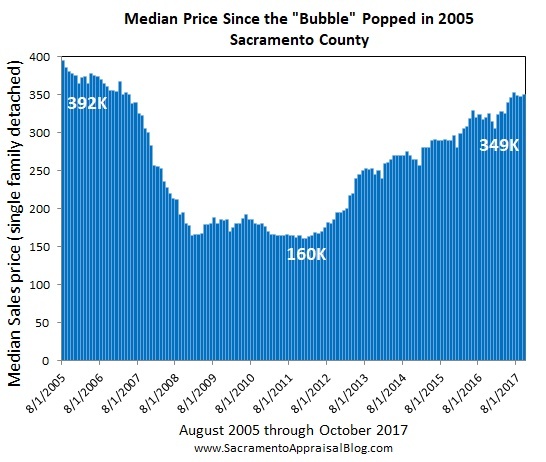 Then for anyone interested I have a big market update for Sacramento. Any thoughts? Fanny pack analogy: Imagine spotting a guy wearing a fanny pack. You might think, “Sweet, I haven’t seen one since the early 90s.” The truth is if we only saw one dude sporting a pouch, we’d probably just think this person is trapped in the 80s and 90s (like Uncle Rico back in ’82). After all, one guy’s fashion statement doesn’t mean it’s a trend for everyone. But if we started seeing more and more people wearing fanny packs everywhere we went, then it’s probably a fashion trend. The same thing happens with pendings. If we only have one pending at a much higher level than anything else in the market area, it’s probably an outlier more than anything. It might be an isolated incident that’s totally disconnected from the market (like one guy wearing a fanny pack) rather than a real indicator of value (a trend). But if we saw a group of pendings shifting higher or lower, then that’s probably a trend. The market has continued to soften, though it’s not really all that soft. 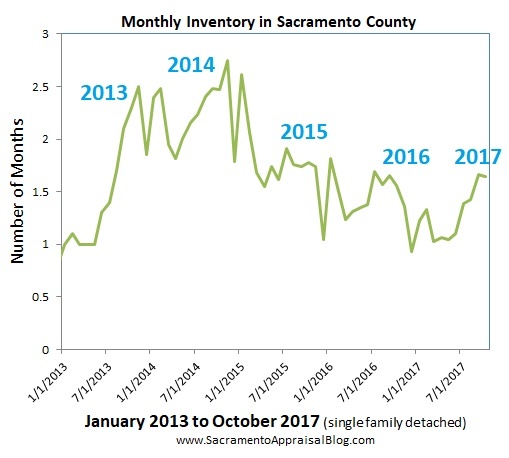 Inventory is up, price reductions have increased, sales volume has been dropping, it took three days longer to sell last month in the region, and price metrics are down about 1% from the height of summer. Overall the market is clearly slowing down for the season, though it’s not painfully dull like it was in 2013 or 2014 during the fall. This is a key to understand because when saying values are “softening” some interpret that to mean the market is really slow or crashing. But that’s not what I’m saying. 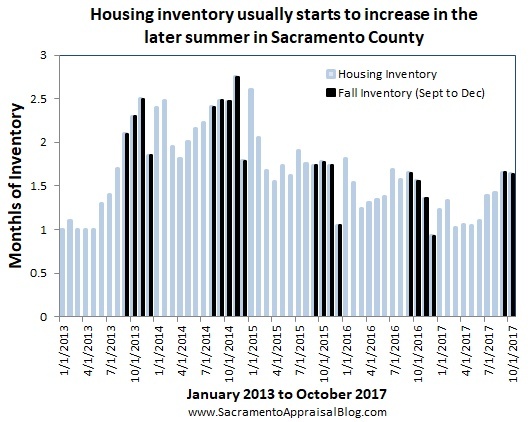 Big Point: We have a housing shortage, but that’s not a trump card to stop a slower seasonal trend. Let’s get technical. 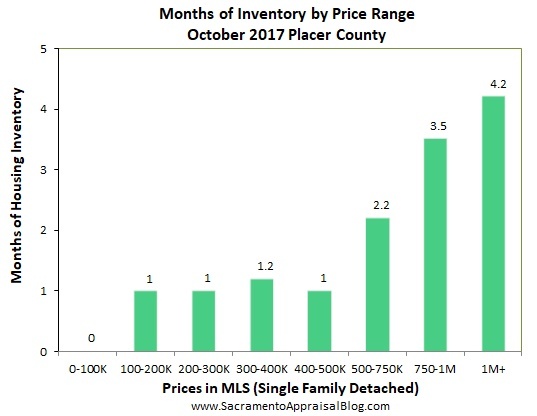 Many price stats last month actually showed an increase in value by about 1%. What the? Does this mean the market increased? I thought you just told me the market is slowing? 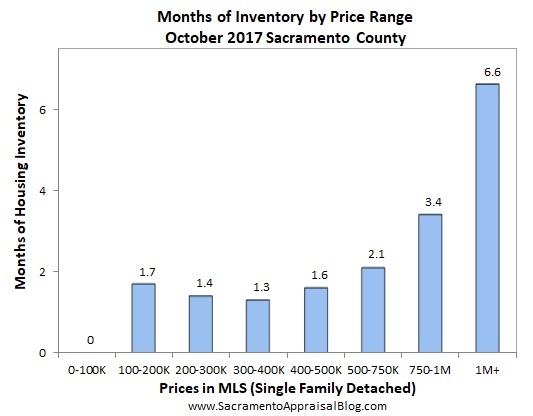 Let’s remember that sales from October really tell us more about properties that got into contract in August and September before they actually closed escrow in October. Thus that 1% uptick really happened in the market a couple of months ago rather than in October. In other words we’ll see the real trend of the market for October when the pendings from October close in November and December. This is so important because let’s not make a big deal about the market technically showing an increase because the uptick didn’t technically happen last month. Know what I’m saying? If we want to see the current market we have to look at the sales, but we cannot forget to give strong weight to the listings and pendings. Are properties taking longer to sell? 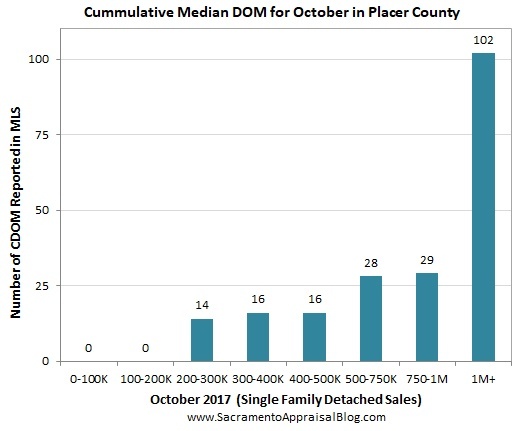 Are there more listings hitting the market? Are properties starting to generate less offers or offers at lower prices? What are buyers, sellers, and the real estate community saying about the market? 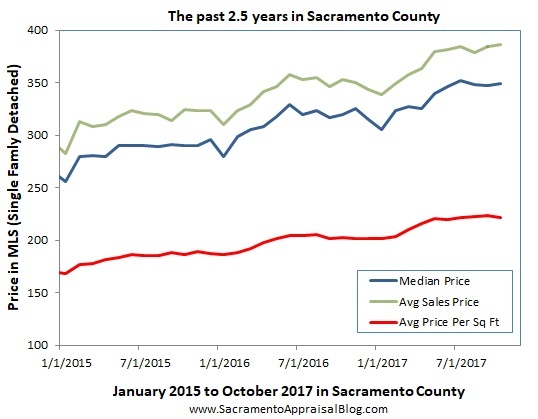 A huge soft stat: Every year the median price and average sales price in Sacramento County tend to soften by about 5%. 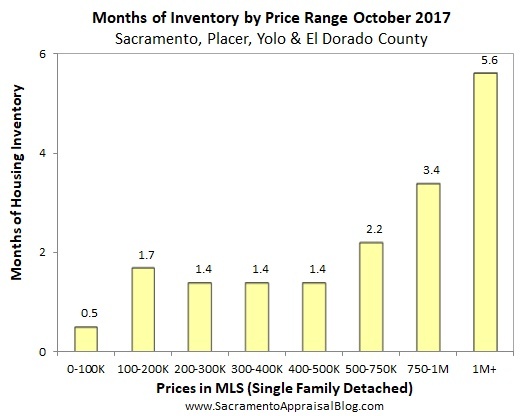 This doesn’t necessarily mean values decline by 5% in every neighborhood or price range, but it does mean we can expect price softening in most areas during the fall season. 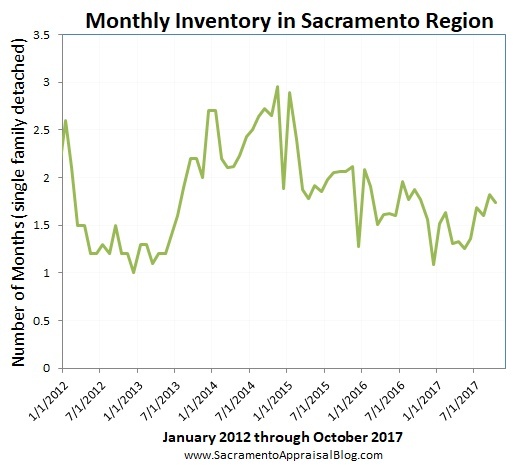 By the way, here’s an article I wrote for Comstock’s magazine this month about some of the different layers of the Sacramento market right now. DOWNLOAD 62 graphs HERE: Please download all graphs in this post and more here as a zip file (includes a stat sheet too). See my sharing policy for 5 ways to share (please don’t copy verbatim). The median price is currently $349,450. It’s up slightly from last month but down 1% from summer. 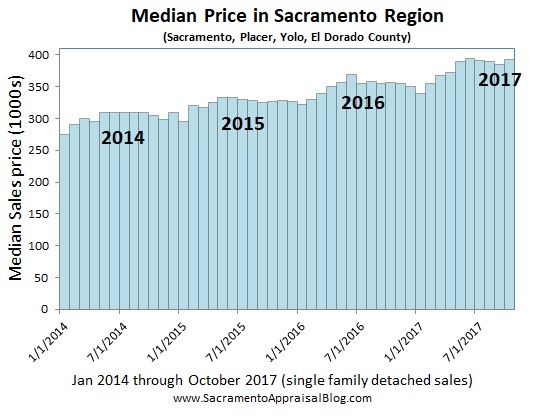 The median price is 9.2% higher than the same time last year. Sales volume in October was 5.4% lower this year than 2016. There were 1456 single family detached sales last month. It took an average of 29 days to sell a home last month (one year ago it was taking 4 days longer). The median days on market last month was 15 days. 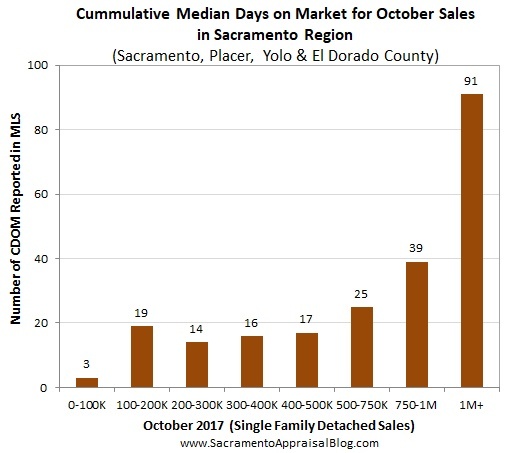 It took 1 more day to sell in October compared to September (median days). 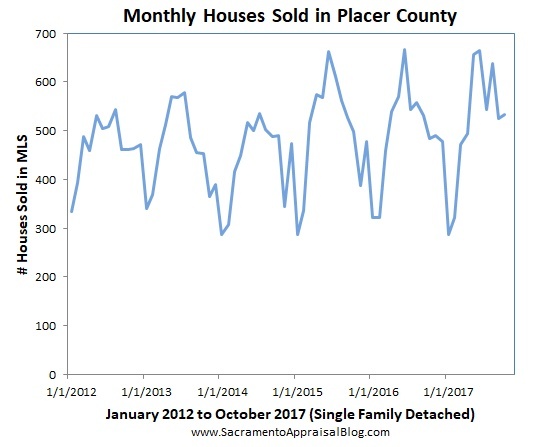 FHA sales were 19.9% of all sales last month in the county. Only 0.7% of sales last month were bank-owned & 0.7% were short sales. The avg price per sq ft was about $221, which is about 1% lower than last month (9% higher than last year). 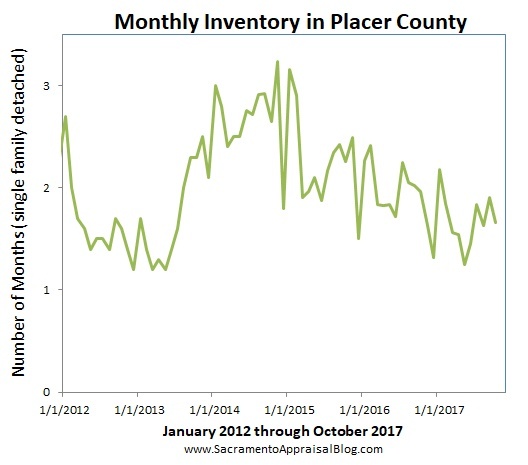 The avg sales price increased about 1% last month and is currently $386,000. This is 9.4% higher than last year. Cash sales were 12.2% of all sales last month. The median price is $392,000. It increased about 2% last month, but it’s down 1% from summer. 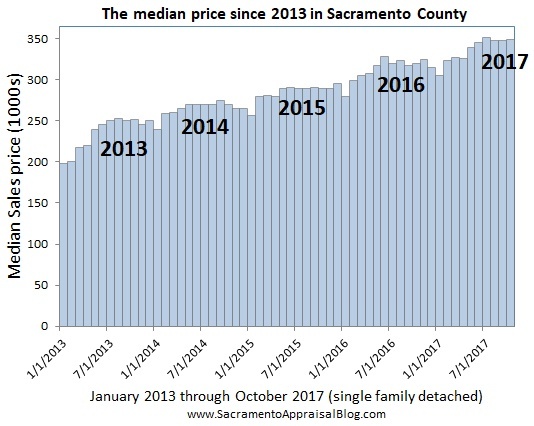 The median price is 9.8% higher than the same time last year. 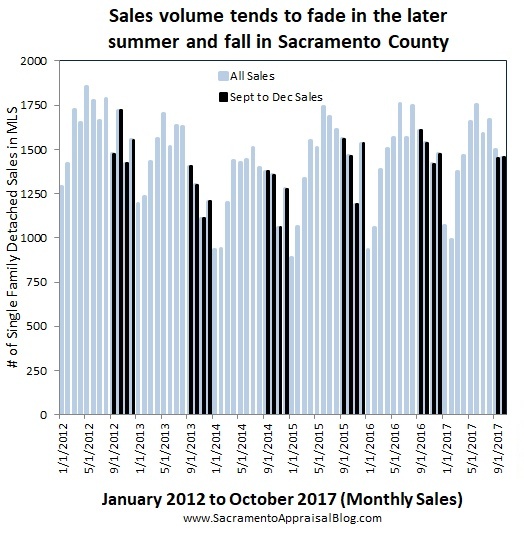 Sales volume in October was nearly the same as October 2016. There were 2380 single family detached sales last month. It took an average of 34 days to sell a home last month (one year ago it was taking 3 days longer). The median days on market last month was 18 days, which means properties are selling really quickly. 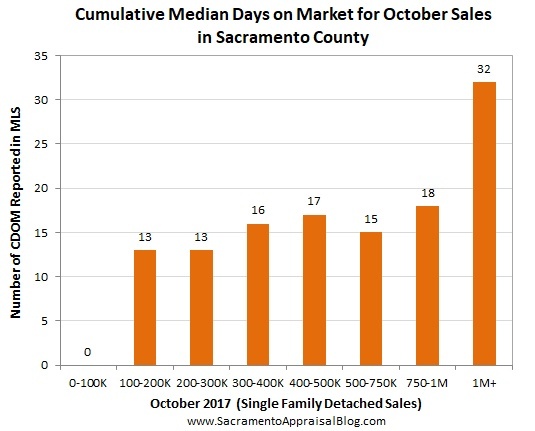 The median days on market increased by 3 days last month, which shows a slowing in the market. FHA sales were 16.5% of all sales last month. Only 0.8% of sales last month were bank-owned & 0.8% were short sales. The avg price per sq ft was about $227, which is down slightly from last month (9% higher than last year). The avg sales price increased about 1% last month and down about 1.5% from summer (but up 9.4% higher than last year. 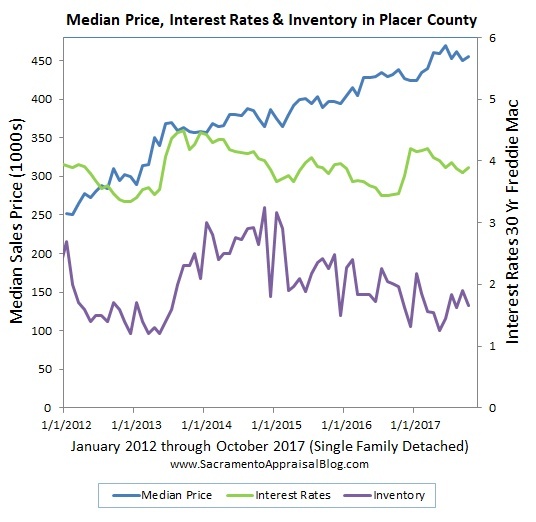 The median price is currently $455,000 and increased about 1% last month. 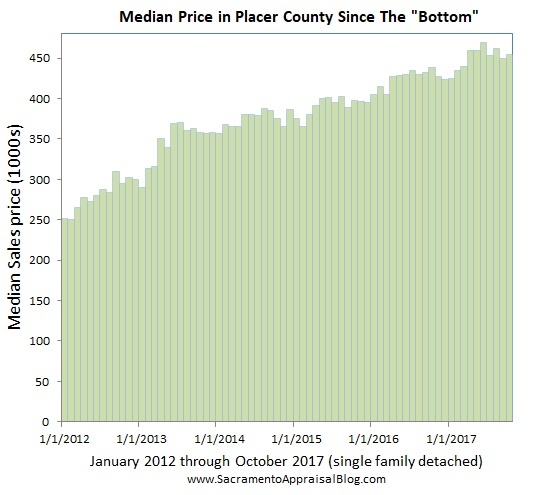 The median price is 3.8% higher than the same time last year. Sales volume in October was 10% higher than 2016. There were 533 single family detached sales. It took an average of 37 days to sell a home last month (one year ago it was taking 4 days longer). The median days on market last month was 22 days, which means properties are selling really quickly. The median days on market increased by 4 days last month, which shows a slowing in the market. 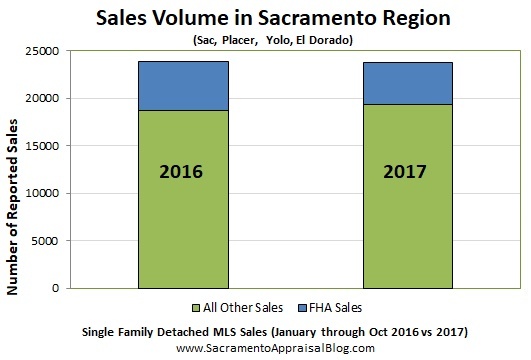 FHA sales were 9.5% of all sales. There were only 4 bank-owned sales last month and only 4 short sales. 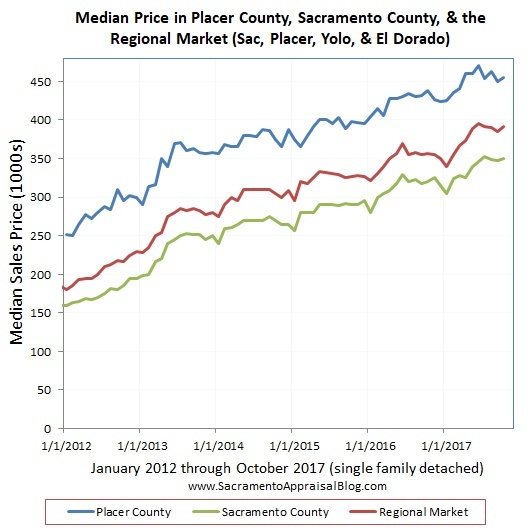 The avg price per sq ft was $232, which is slightly higher than last month (9.2% higher than last year). The avg sales price is currently $511,121. This is 6.4% higher than last year. Cash sales were 18% of all sales last month. Questions: On a serious note, did you wear a fanny pack back in the day? Anything else you’re seeing in the market? I’d love to hear your take. I was purchasing a bunch of tool belts for the appraisers in my office (launching a new service) and it got me thinking. A tool belt is just a manly fanny pack. Love the fanny pack analogy! I don’t know about Sacramento but in Texas,I am not seeing the fanny pack trend making a comeback. Great market data as always! Well my first thought was, apparently Ryan saw me and my fanny pack as I got my gear wrapped around me to go do my site observation work (note no mention of inspection, as I ain’t no inspector, oh shoot I said the bad word). So what is wrong with my fanny pack. I think it looks good on this beat up ol’ cowboy. Ryan great info as always, but apparently you don’t have my sellers up there. Down here they truly believe one sale does make a market as long as it is priced high for them and their Castle. Ryan take good care and I wish you and your family a great Thanksgiving. Now I have to go readjust my fanny pack straps to take in the Thanksgiving Day food that is about to happen. We do have the same sellers, and it’s so easy for them (and all of us) to get fixated on that one high sale or pending. It’s like being pulled in from the tractor beam from the Death Star. We see this dynamic especially with incredibly overpriced listings. They get a ton of media publicity and attention, but they don’t sell (which means the list price says nothing about actual value). This is why I love Jonathan Miller’s “aspirational pricing” term so much. Have a wonderful holiday Brad. Thanks again for the comment. Thanks Ryan! Good analogy with the fanny pack.